Eye On Tampa Bay: Election rigging? Having lost the great rail tax referendum in 2010, now "some government leaders" in Hillsborough are trying again. Three years after Hillsborough County voters soundly rejected a one-penny sales tax increase to fund transportation projects, some government leaders are talking about holding a similar referendum next spring. Though details are still sketchy, proponents say the referendum could be held in March to coincide with the Tampa mayoral election. They don’t want to hold the referendum this November because a similar transportation tax is on the ballot in Pinellas County that month and officials here want to see how that vote goes. I guess we can't handle too much information? Last I checked Hillsborough County residents can't vote in Pinellas. Who are "some government leaders"? Tampa Mayor Bob Buckhorn said he supports holding the referendum in March. By that time the county and city transportation planners will have identified the projects, including a potential rail route, giving the policy group time to vote on the list as well as a funding source, he said. The usual rail cheerleaders, Mark Sharpe, and Bob Buckhorn, leading us into the next rail disaster. Light rail crash of the day.. coming to Hillsborough? Mayor Buckhorn, how much is that Trolley costing Tampa? Can you first make that trolley financially sustainable before you lead the county into a financial rabbit hole? So they'll take four months after the Pinellas election and figure our transportation plans -- roads, buses, rail, bikes, pedestrian -- for the March 2015 ballot.... that will ostensibly plan for the next 25 - 50 years? Buckhorn as already assumed we need to "figure out the rail side of it". Has he not learned from the failures the last time around that if they really want to "figure out the rail side of it" it is to save the citizens money and not do it? Other commissioners said a March referendum would not give the policy group time to digest the large package of transportation projects still being developed and then sell the improvements - and a tax increase - to county residents. Not that the Eye believes in this type of planning.... but our planners do. What's missing in the article? The names of the people behind this effort. Who are they? Are they our local politicians? We have some "sketchy" comments from the Mayor and some county commissioners, but who's really proposing this? The facts are that the 2010 referendum passed in city of Tampa, but was overwhelmingly defeated by Hillsborough County voters. There was no costly rail "planned" other than a USF to downtown to airport route. Since the defeat, HART, under new pragmatic leadership, deployed the new MetroRapid route in less than a year, for 1/60 (!) of the cost of the planned costly USF - downtown light rail route. Other plans such as the Hillsborough MPO 2035 Long Range Transportation Plan did not show rail deployed to Brandon, perhaps the worse transportation issues in the county, until 2035! 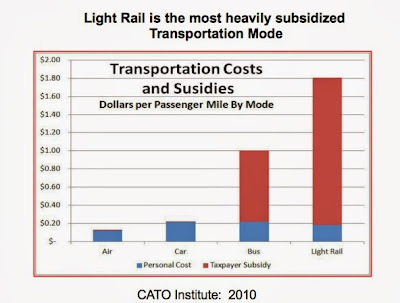 Light rail is the most highly subsidized mode of transportation. Filter out those details and facts, Commissioner! Now they want to stage yet another referendum coincident with the Tampa Mayor's election, which of course will bring out Tampa voters, but there will be very little if anything else of interest for Hillsborough County voters. Which Hillsborough County Commissioners are going to support a Hillsborough County referendum for a city of Tampa election? If they can't win by being informative, transparent and making their case to ALL the voters, then schedule the election so they minimize the exposure and squeeze it in by rigging elections. It's also convenient this article is published on the same day that Connect Tampa Bay, a local transportation activist group, is re-emerging with their 2014 kickoff meeting tonight. We've always known these rail proponents would try again. It's a common pattern, as most votes on the rail led comprehensive transportation referendums in most municipalities are voted down the first attempt. The proponents spin it up again and again, until they wear us down.